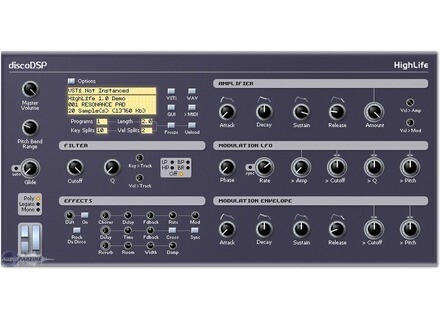 HighLife R3 beta now is presented as featuring "improved sfz import, more in line with the official sfz specs" Most sfz files can now be used right away without the need to edit out any unsupported features or moving the soundfiles around on the computer, according to discoDSP. Sample path can be relative or absolute to any location on the storage media. Path names may contain blank spaces. The <group> header can now be used. Comments can be put on the same line with opcodes. A couple of wave files that were refused by the previous version will now load fine. Loopinfo will not be used if loopstart > loopend (workaround for some nonstandard wav editors). HighLife supports a subset of the sfz specification v1.0 opcodes. Unsupported opcodes can be included in the file. These will be ignored and should not cause any errors or misinterpretations. Unsupported headers (sfz v2.0 or third party) will be skipped. The parser will jump the next header if it finds an unknown one and ignore all opcodes in between. 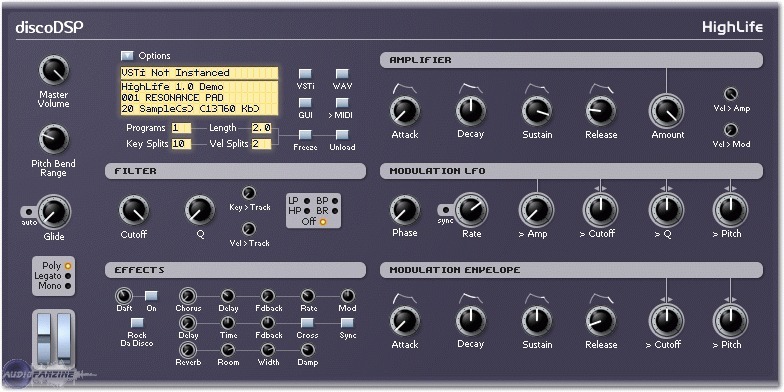 sample, lokey, hikey, lovel, hivel, offset, tune, pitch_keytrack, pitch_keycenter, transpose, volume, pan, loop_start, loop_end, loop_mode, loccN, hiccN, lobend, hibend, lochanaft, hichanaft, lopolyaft, hipolyaft, trigger, group, off_by. MIDI Note Names are currently not supported. Workaround: replace with MIDI note numbers. The key opcode is not supported. Workaround: use lokey, hikey and pitch_keycenter instead. Xor and Mojo Plugins for Scope Platform Adern has announced the release of two new plugins for the Scope platform.